Really powerful marketing ideas are all born from simple psychological principles. Storytelling may be a popular buzzword now, but the truth is we’re wired to like stories. They help us better understand the world around us. Children learn social or moral rules through fables, we remember scientific concepts through analogies, and they help us relate to and empathize with others. When done right, storytelling engages your customer in the long-term, allowing them to relate to your brand’s personality and mission, and feel emotionally invested in your success. 80% of consumers want brands to tell their story but can’t remember a good example. So how do you do it right? There are no hard and fast rules but here are some ideas to help you tell your brand’s story through email. Brand storytelling is essentially storyselling. To stand out from the competition, you have to show your personality and win consumers over with your character. When deciding how to tell your story, ask yourself what your angle is. Are you disruptive, innovative? A healthier or less expensive alternative? An eccentric, playful persona? Jack Daniels knows how to storytell. Their angle is: we’re a timeless classic – we’ll always be relevant and funny. In each ad, they celebrate their history and embrace their traditions. Even with a historical theme, their stories are always relatable. They often mention their employees, showing a human side to the brand, and use a shared sense of humour to connect with their audience. Every story should have a good introduction. Use a welcome drip series to set the scene. Include a short video to introduce your mission and show your user what you have to offer. With TOMS, the user can customize their relationship with the brand, choosing which stories they’d like to hear from the get-go. The brand also describes themselves as a ‘movement’ and a ‘family’ – they’re not just a faceless corporation. Their story is one of a community with a strong mission. If you’ve ever watched Catfish, you’ll be aware of just how damaging fake images can be to a relationship. To establish trust with your subscribers, don’t use stock images. Welcome your user or celebrate your success with real but professional team photos. We all know when a smile is fake. In testimonial campaigns, use a photo of a customer who’s genuinely happy with your product and support. Have a look at Uber’s campaign. The company uses a real story -how one of their drivers saved the lives of four people- to build their own. They use the emotional appealby putting the spolight on their driver’s heroism rather than on the company. They also involve customers by encouraging them to rate their drivers as a sign of recognition. Probably 5 stars won’t do it if the driver saved your life, but it’s certainly a start. Every tale needs a hero and your customer will be yours. Celebrate milestones (shared and general company ones) with them and they will save you from the SPAM folder. A favourite tactic of American Express is to showcase stories of customers who have used their rewards to achieve success – a different take on the traditional testimonial campaign. Once upon a time, stories were just passed on by word-of-mouth. Now there are so many different ways to tell and spread your message: email is one of them, but you can embed and connect other medias along. Storytell through video. Video can combine movement, human faces and music – all powerful ways to capture the user’s attention. It also has more potential to go viral on social media than links and text combined. Embedding a video doesn’t have to be tricky either – there’s a workaround. Spread your story with social (media + proof). Extend your brand’s reach by integrating email and social media and using referral campaigns. This will increase the number of prospects and customers that get to read your story and it will help your company develop a full, cohesive and powerful image that will make your brand stickier. Now that you’re all set, it’s time to go evangelize customers with your brand story on email. Don’t forget to try different versions of your messages -up to 10 thanks to A/X Testing and segment your contact lists to tell the right story to the right people, so that your recipients are so hooked up on your story that they’ll love you forever and you’ll live happily ever after. Now it’s your turn to share your story: do you use storytelling as part of your brand identity and marketing strategy? Tweet us your tips or share them in the comment section below! Time out. What exactly is Segment? If you peeked under the hood of your website or app, would its headers and footers look like piles of code from the Matrix? If so, the upside is that you’re likely using all the cool tools to track your visitor’s activities. The downside is that all those different code snippets are a nightmare to manage, plus they put your loading times at snail speed. Cue Segment. Segment is a single API that allows you to collect customer and user data and send it to hundreds of tools for analytics, marketing, and data warehousing. You simply replace your matrix of code snippets with a single snippet of Segment’s code and then connect your tracking tools to Segment. Instantly, your headers and footers are alleviated of their hoarding problem and your loading times warp to lightspeed. So tell me what this integration does for me? And include doughnuts. Of course. The integration between Segment and Mailjet lets you do two types of equally powerful actions (with examples illustrated by a doughnut shop – mmm). Use information feeding into Segment from your other mobile apps and websites to create new Mailjet contacts or enrich existing contacts with additional properties (e.g. name, gender, geography, purchase history). This component is called an “Integration” in the Segment interface. The benefit? Highly segment your contact list so that your campaigns only go to the people most likely to be interested in them. Example time: You want to send an email campaign promoting your limited edition American Independance Day doughnuts, decorated with an American flag. Thanks to geographical information from your other sources (added to your email contacts via Segment) you can send a targeted email campaign to just those living in the USA, within 20 miles of your doughnut shop locations. Segment can also pipe email event data (e.g. opens, clicks, bounces) from Mailjet into the 200+ other SaaS tools also integrated with Segment. This is component is called a “Source” in the Segment interface. The benefit? Analyse the real effects for your email campaigns. Example time: You just did a big email marketing push announcing your new cat-shaped doughnuts. By sending the results of this email campaign into your e-commerce tool (via Segment) you can correlate the number of cat-shaped doughnut purchases that came directly from those who opened your email (and how many more doughnuts that user group buys down the line!). Better segment email contacts and send them only the most pertinent emails. See how email behavior affects conversion funnels. Stop retargeting people when they open your emails. Send past email behavior to tools that predict churn detection or upgrade opportunities. Performing these types of analyses has typically required spreadsheets or custom ETL processes. With the Mailjet x Segment integration, you can capture email data with just a few clicks and no new code. Cool, is it hard to set up? Of course not. Setting up the Mailjet x Segment integration takes less than 3 minutes (yes we’ve timed it). You will simply need to activate the integration on both the Mailjet side and the Segment side. The incredible user guide is here. Love it? Want to try it? Head here to get on the Mailjet x Segment train. As always, ping us with any questions or feedback. As consumers, we all appreciate to be greeted when we enter a store. A friendly face, a warm welcome, useful directions to find your way around, information on a special deal going on… There are countless ways a warm welcome can dramatically change a customer’s experience. Why would it be different online? Automating emails has been reserved to large enterprises for too long. It was expensive, mostly because it involved a lot of development in the implementation phase, as well as extensive business consulting to design the automation strategies. Today, Mailjet empowers every company, from SMEs to startups and Enterprises, to leverage an easy-to-use email automation tool. It is time-consuming for businesses to define the scenarios to implement and create a clear automation roadmap. We decided to ease the pain of out it, and worked with several marketing automation experts to understand how it could help business and what really drives revenue. We have come to understand that one of the issues around email automation is that it is so broad it can be overwhelming for first-time users. So we have decided to create a set of predefined automation scenarios that dramatically reduce implementation time and help marketers get a quick start, by just predefining the event that will trigger the automation flow. Customers are not all the same, and even if automating communication is key, it is essential to take into account their different behavior, tastes or habits, to create relevant messages. We allow you to segment the recipients of your triggered emails to create more relevant communication flows. You can, for instance, segment your audience based on the location of your contacts, to deliver special information that is relevant to their area. Or segment based on language settings, to write to them in their preferred language. Once your triggered scenario is chosen, you can then build your flow. You can effortlessly add one or several emails in our intuitive interface. The trigger and the different emails can be separated by a customizable delay. You can, for instance, create a series of three emails – the first email being sent out immediately; the second one, three days after and the last message, five days after the second one. Mailjet’s users can combine Email Automation with Passport, our intuitive drag and drop email editor, to easily create breathtaking responsive emails that look good across devices and clients. To make sure your automated emails are as relevant as possible, you can leverage Passport’s personalization feature, to address contacts by their first name or tailor the message using any information you collected. Quantitative feedback is so important for marketers that we decided to integrate statistics to enable you to follow the performance of your messages. Track open, clicks and all the other useful email metrics to discover how your emails are performing and understand how to improve your messages. This new feature paves the way for exciting new automation opportunities. We are working on new scenarios that will allow you to implement more advanced automation strategies, based on what is effectively working for some of the best-performing companies in the industry. Email Automation is part of our Premium Features. Create an account today and get a 30-days free trial to test Email Automation. Most tech experts will tell you that: wearable technology is the next big trend. Earlier this year, Gartner estimated that global wearables sales would grow to 18% in 2016. The same growth is expected for 2017. By the end of 2016, around 275 million wearable devices will have been purchased. With such growth, and smartphone sales set to stagnate in the mature markets, it’s no wonder that smartwatches and, to a lesser extend, smart glasses, are seen as the next devices to conquer. For email marketers, more and more devices on the market means another thing: creating emails that display properly on ALL screens will become even more complicated. We’ll address the display challenge of smartwatches here. After all, they’re the connected wearable with screens that have the highest growth. Plus, at the moment, there are too many pending questions regarding smart glasses to write precisely about how emails will be displayed on them. The first issue is obviously the size of the screen. With an average size of 9 to 16 cm2 (more or less the size of a postage stamp – you know, those things people used to use to send mail with, that they now collect), what could you actually display? As usual, these things are complex. Depending of the device, your message will display either one or two lines for the subject line, and between 30 and 80 characters of the message body. Even if there are huge differences between the different brands, we’ll all agree it isn’t a lot of text. 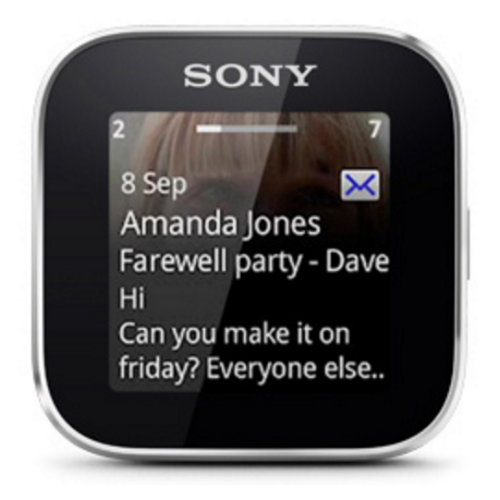 In addition, users can set rules for the emails they want to receive on their smartwatches. 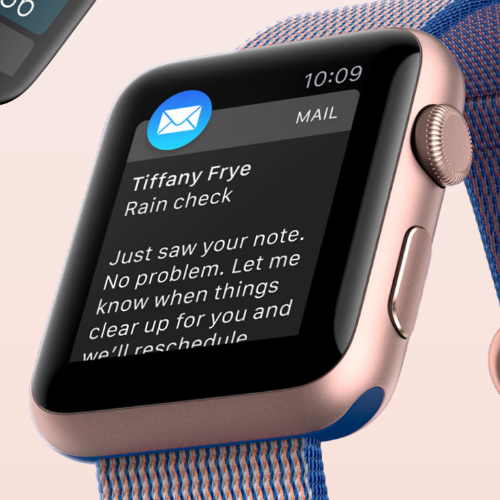 Meaning all the emails that land in their inbox won’t always be notified on their smartwatch. If your emails are among those, once again, all your design and integration efforts will have been for nothing. So… should I care about emails on smartwatches? Smartwatches are definitely something you want to keep an eye on though. They are becoming a thing (and you can expect more and more people to get one – even your parents). Meaning at some point, in the near future, the technology will be good enough to display your emails.When that time comes (sooner rather than later), you’ll be happy to have prepared for the reign of wearables to come. You can start simple. Since it’s likely that the number of characters displayed on the screen of a smartwatch won’t evolve (contrary to the technology), you have to keep applying the rules you – obviously – already know, i.e. keep your subject lines short, and put the content you want your recipients to take action on right at the beginning of the message. Also, be clever with your preheader: put your most information here too. Email on ApplewatchAnd to finish, you can start optimizing your sender name. Currently, yours might be something like “John Smith from Mailjet”. This is too long for smartwatches. You want to be immediately recognizable by your readers. We know that your sender name is part of your identity. So why not try something less formal (and short!) like “The Mailjet team”? You’ll sound more approachable, and your full name will fit the few pixels of the smartwatches screens. The above is general advice that you can already apply to your email campaigns, even if wearables are not your main focus right now. You’ll already have the basics set up for when more and more people have smartwatches and actually be using them more widely to read emails. Then, you’ll be ready to focus on more advanced solutions for your smartwatch audience. Instead of offering the exact same content your readers will have on their other, more responsiveness friendly devices (smartphones, tablets, laptops or desktops). For example, you might want to send them content specifically designed for the smallest screens: barcodes to be scanned when they check-in at the airport, QR codes with discount codes… The future will tell us! Email marketing and social media marketing are not far apart in the spectrum of digital marketing. In fact, all other techniques considered, these two are probably the easiest to integrate, and both can benefit from doing so. While effective separately, combining your social media and email marketing strategies can go a long way in helping you to supersede your Internet marketing goals. This article highlights the best way to merge your email marketing strategy with your social media efforts. You might be saying to yourself, “Are people still running email marketing campaigns? Isn’t that outdated?” While the last few years have seen newer techniques coming into the field of digital marketing, email marketing still has its place in today’s environment, and a very important one at that. Studies have been carried out about companies that ditched their email marketing campaigns in favor of sole focus on social media and the other digital marketing strategies. Some have shown success, but these are the exception rather than the norm. If you still believe email marketing has lost its relevance, check out this infographic on the value of email marketing. If you’re still not convinced, think about how many times you check your mail in a day, or even hour? See? Good, now we can continue. Why should your email campaigns include social sharing abilities? Are there any benefits to inviting your email subscribers to also connect with you on your social media profiles? Should email marketing and social media be integrated? To extend email reach – if more people share your emails, you increase your potential for more click-throughs, opens and conversions. To identify key influencers – most email service providers offer metrics on the people that have shared your emails, most of which include the effects of their sharing efforts on other key metrics like clicks, opens and conversions. Using this data, your marketing team can better understand and leverage the power of these influencers, such as sending dedicated campaigns to these self-made brand ambassadors. To grow your subscriber list – with more people looking up your emails, you can improve your chances of growing your email subscription list. It gives you another platform on which to engage with your audience – different platforms provide different opportunities for outreach and engagement with your customers and subscribers. It gives email subscribers options – perhaps your email subscribers are more often found on social media and would prefer to engage with you there. Email is great, but it shouldn’t be the only option they have for interacting with your brand. It improves reach of your message – why should you limit the potential reach of your email communication, when just a few small buttons can get your message out to other people in other networks? Before delving into details of how you can integrate social media into your email campaign, it’s important to note that there’s a difference between connecting and social sharing. The former is what you do when you ask a subscriber to like you on Facebook, follow on Twitter or subscribe to YouTube etc. The latter is where the marketer includes options for the subscriber to share their email on their own social media profiles. Below are some ways you can apply to get email marketing and social media integrated for maximum efficacy. This sounds obvious, and you probably already do it. However, what we’re talking about is not slapping on a tiny Twitter or Facebook icon somewhere at the bottom of your email message. Say it loud and proud, right at the beginning, in a place where readers won’t miss it. It isn’t enough to just have social icons. While many subscribers recognize the icons as social sharing buttons, not all of them know what action you’re inviting them to take when they come across the icons on an email. Tell them exactly what you want them to do. If it works for your brand, you can do this in a creative and/or humorous way. Some users may still not follow through with your desired actions even after seeing the buttons and reading your share and connect call. If you’re not seeing much success with the above, you can send a dedicated email message specific to one social platform. For instance, you can tell subscribers why they should like your page on Facebook, and how to do so. Just like everything else on Earth, human beings respond better when they know they have something to gain from whatever it is you want them to do. For instance, some companies urge subscribers to get their friends/networks to follow and like them on social media in exchange for store discounts on purchases they make. It doesn’t have to be a financial incentive though.You can offer other incentives like giving subscribers a chance to be featured on your next email correspondence. The bottom-line is to give them a reason to share and connect. If you have a strong presence in one social network, you can use it to ask people to subscribe to your newsletters and email correspondence. You can promote email opt-ins on Facebook, Twitter and elsewhere. The important point is to use each channel to boost other channels you’re featured in, called cross-promotion. Highlighting a specific tweet in your email campaign can help to cross-promote your campaigns on email and Twitter. The good thing about featuring a particular tweet in your campaign is that it fits well into the ‘sharing from your community’ point. On Facebook, you have the option of embedding an email sign-up form among your apps. Take advantage of the opportunity to ask your Facebook fans to subscribe to your email list. There you have it, you can use social media miles to improve your email marketing campaigns, and vice versa. Have you tried any of these ideas before? Share your thoughts with us! These creative design tips put together by the design platform 99designs assist businesses and startups of any size to enhance marketing strategies by email considerably. The popularity of email marketing is increasing by leaps and bounds. Many small to medium-sized businesses now devote a major slice of the marketing budget to email campaigns. Email is a very effective way of facilitating direct contact with your existing customers as well as developing better relationships with prospects or leads. Email correspondence allows any business to customize information and send quotes, business updates or promotions rapidly. This kind of interesting and useful information will lead to increased website traffic and conversions for your business. The growth of email as a major sales and marketing tool means that it is imperative to adopt a meaningful email design and message. Your customers and prospects must easily be able read and absorb information provided, which will create a better overall user experience for your audience. Nothing beats expressive, high-quality images when it comes to grabbing customer attention on the Internet. Images are far more effective than long texts as potential customers will not need to spend too much time or attention absorbing the information provided. Presenting your brand image and character visually can often trigger powerful buying emotions. You should also label or describe each photo with optimized text (Alt text) to enhance your email and impact on any potential search queries and search results conducted by your prospective customer. This text will also ensure readers get grasp of what the images represent, even if they don’t load properly on their emails. Boom! Bold use of bright, vibrant color can draw consumer attention and create an impact. If you want your email marketing messages to stand out and catch the eyes of your prospects, use of color psychology is another proven key to success. Color can be emotive, with certain colors, tones and shades trigger particular feelings and associations. It is important to consider your target audience and cultural influences when taking an approach of this nature, alongside remaining authentic to your overall brand image and message. Adding eye-catching graphics are another important element for success with email marketing. Fun or interesting graphics will complement corporate design features and are likely to build more of a rapport with your customers. It’s a much quicker and more engaging way to communicate with your fanbase. Adding attractive artwork to a marketing email impresses prospects and gives them a reason to continue following what you do. Providing drawings in addition to blocks of text, graphics, color and Calls to Action (CTAs) are key elements of making your content work in a digital environment. It adds personality to your emails and helps build and strengthen customer relationships. Customized artworks and drawings should be based on your brand and its values, so getting a talented designer to provide artwork of this nature is a winning formula that enhances any marketing campaign. Different fonts in a range of sizes, colors and orientations provide opportunities to relay a good deal of information within the limited space of an email. Take time to play around with the structure and organization of all your marketing copy to find the layout that gives the best visual impact. It’s important to also balance this with readability and make sure it’s clear for your readers. Use of color within your text should complement the elements already discussed above at point 2 and help your customer build bonds and links with your brand and products offered. Irrespective of all your creative inputs, don’t overwhelm your recipient with too much information. Sales and marketing emails need to be short and snappy, giving details with clarity and information that’s easy to understand. This will make it easier for you to design your email for mobile (which is necessary because a big part of your subscribers will open their emails on a mobile device) and to create a great experience for your users on all kind of screens. Take time to review the details provided and ensure it is the minimum required to raise interest and that the layout is clean and crisp. This way your readers will soon recognize any Call to Action (CTA) and be far more engaged within the reading and information gathering process. Always include your company business logo at the top of any email. Your prospective customers and clients will soon learn to recognize the logo, which will create trust and enhance the process of initiating interactions. Compose your schemes for every email separately according to the type and destination of your email campaign focus and layout priorities, bearing in mind all the tips highlighted above. It won’t be long before you are inspiring customers and prospects with your fresh and impressive email compositions and increasing the number of visits to your website and associated sales! At Mailjet, we don’t do settling. Settling is to Mailjet what kryptonite is to Superman. If we’re too close to settling, it’ll kill us slowly. That’s why at Mailjet we’re always aiming for bigger and better things. Recently, Mailjet took flight at one of the world’s most popular digital marketing events, the Gartner Digital Marketing Conference (we’ll refer to it as Gartner DMC from here on out), which took place in San Diego between the 17th and 19th May. It was a great opportunity for us to join the big boys in the industry, learn about the latest trends, share our knowledge and introduce our product to all the attendees. So, what did we learn at Gartner 2016? The Gartner DMC is an opportunity for industry leaders to get together and discuss the latest news, trends and innovations shaping the digital marketing landscape. During the event, marketers get together to talk about the hot topics, attend sessions and mingle with like-minded professionals to get the best insight on what’s on and what’s coming. Now, on its second year, the big theme of 2016 was Data and how we should make sense of it to use it actionably. As marketers, we collect lots of personal and behavioral information about our clients and prospects but, how smart are we about using it? Just as it happens with everything digital, the amount of information is creating an excess of noise and it’s making it really challenging to actually use it to our advantage. Marketers have data paralysis. With so many tools on the digital marketing landscape, the temptation is to accumulate data, but few know how to actually make sense of it. Smart Data is about putting all of that information to good use, to drive marketing efforts and generate sales leads. The future, it seems, will bring easier ways to analyze and manage data and to set smart goals based on it. Customer experience was also at the center of many conversations. At the end of the day, everything we do as marketers is targeted at the customer and providing a well-rounded experience that answers to their every need is at the core of our daily job. Automation is an imperative tool to ease our workload and we can ensure that personalizing our customer journey, tailored to our customers individual needs, does not become every digital marketer’s nightmare. And what did Mailjet make of the experience? We were sure Mailjet was going to have a safe flight at the Gartner DMC, what we hadn’t guessed was how excited people were going to be to learn more about Passport, our easy-to-use drag and drop editor that makes designing responsive emails simple. Being able to create beautiful transactional templates without having to get the IT team involved really got people’s attention, including our friends at Ford Mexico. And since Gartner 2016 was all about data, we had the opportunity to share our insights, show people what we do at Mailjet and tip professionals off about the great ways to use statistics and our customers information in a smarter, more engaging way with our platform. However, it was not all about showing off our platform. As with all of these events, the most exciting part about of Gartner DMC was being a part of it all, enjoying some great energy during the three days and actually chatting with and learning from everyone that dropped by booth 413! Were you there? Have you attended a similar event recently? What did you get out of it? Tweet us about it or comment below and tell us what you thought and what you learned! They say content is king and we’re not denying that, but we believe that there’s one ace that can trump the king, and that’s Moment Marketing, also known as micro marketing. No matter what your brand has planned, when a special moment arises, everything else goes out the window. Moment Marketing is the ability to take advantage of an event to deliver relevant and related, seemingly spontaneous, and often fleeting interactions with customers in real time. Thanks to social media, it’s easier than ever for companies and brands to hop on the latest trend. From the #RunningManChallenge, to the famous Oscar selfie or the tweet by Oreo during the Superbowl, these marketing moments are only open for a small period of time. Sure, we can talk about cool examples all day long, but why not show you how to do it yourself? Here’s a few ways to incorporate Moment Marketing into your email strategies.